It’s that time of year again for snowflakes, candy canes, mistletoe and–of course–holiday ads. And nobody does them better than the out-of-home industry. Take a look at some of this year’s unique and eye-catching campaigns. Here is a great example done for London’s Heathrow Airport. Following their slogan, “Making every journey better,” the world’s largest sprig of mistletoe was hung in Terminal 5, perfectly placed for a quick kiss between reconnecting loved ones. This OOH campaign for Gap combined a very noticeable plaid wrapped bus and the peppiest street team I’ve ever seen (especially at 5:30 am). Made up of 12 professional dancers and drummers–all sporting the Gap plaid–the street team began in New York City’s Times Square, spreading holiday cheer as they flipped, shouted and threw giveaways into the crowd. Then they hopped back on their bus and headed to the next city on the tour. The flash mob may be overdone, but who can ignore a couple hundred dancing elves that appear out of nowhere? Brought to us by OfficeMax, the holiday sensation Elf Yourself made its presence known this year with hundreds of elves and a choreographed dance that took place in New York’s Union Square. When the dance was finished, the elves ran off, yelling out, “Elf yourself” as they went. To launch its annual holiday campaign, Coca Cola worked with Eye to dominate the Belfast International Airport using digital screens and traditional formats. Well, you can’t blame the Captain for trying. According to Media Life, Captain Morgan came up with a plan to get NFL players to pose in the iconic Captain’s stance (knee up, hand on knee, other hand on hip… assuming you’re short a sword) after scoring a touchdown. In return? The rum company would donate $10,000 to the Gridiron Greats Assistance Fund for each player who struck a pose during regular season, $25,000 during playoffs and $100,000 during the Super Bowl. Not a bad deal considering 30-second TV spots can cost millions and still don’t generate buzz like many guerrilla advertising stunts do. 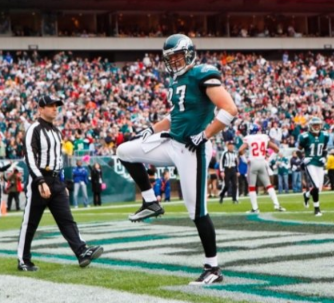 Unfortunately, Philadelphia Eagles tight end Brent Celek got a little too eager and decided to pull out the move in a game against Dallas nearly a week before the campaign was supposed to kick off. Although the cameras caught it all and Captain Morgan still got its moment in the end zone, the NFL jumped on it almost immediately in an attempt to safeguard existing agreements and sponsorships. So even though there will be no more celebrating with the Captain during game time, it was still a great plan and even succeeded in creating the buzz it set out to.